Un interessante documento sulle Antenne Filari, tipologie di antenne, il calcolo, la teoria e l'autocostruzione a cura di Riccardo Rossi I5CDF si trova sul sito dell'ARI di Firenze. The MWC's group page will be open to everybody, not only Circle members. We would like to assemble as many medium wave DX'ers as possible - so please pass on the word! As the page is only a few days old, there is not yet much on it. But you can change that. If you have items to share (which are difficult to share via an e-mailing list, such as QSL pictures, shack pictures, interesting documents or links, and much more), then feel free to add something. Although perhaps inevitable, it is not our intention to disperse information even further. We just want to offer members and non-members alike an additional service with which they can be in touch with each other and can share things or get help. And finally, yes, we do hope that non-members may learn what a wonderful club we have and may express their wish to join. If you have difficulty in uploading items, please feel free to send them to me or ask me for help. We also welcome any ideas or suggestions you may have. - Herman - www.hermanboel.eu "
Questa volta mi sono preso la briga di guardare a fondo il sito . 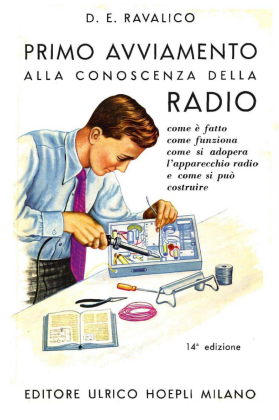 Una vera miniera per chi restaura radio d'epoca , scale parlanti , schemi , libri , manuali , etc . - Come costruire le bobine a "nido d'ape "
- Efficienza di una antenna trasmittente " a filo "
- Semplice alimentatore stabilizzato CC 180-300 V (lo avevo buttato via credendo che non mi sarebbe servito mai piu' e mi sono mangiato poi le mani tutte le N volte che mi sarebbe servito .... ) .